Pressure has been mounting on the minister today to clarify the situation, with the opposition claiming that the minister misled the Dáil. This was the line the Communications Minister Denis Naughten continued to repeat to his Dáil colleagues this afternoon. On his feet for over an hour, the minister faced a grilling about the contact he had with a PR agency over the proposed takeover of Celtic Media by Independent News and Media (INM). The Irish Times reports today that in November 2016 details of a conversation between the minister and Eoghan Ó Neachtain, director of public affairs at Heneghan PR, was relayed to billionaire Denis O’Brien, who is INM’s largest shareholder. During that conversation the minister reportedly advised that the proposed takeover of Celtic Media by INM would be referred to the Broadcasting Authority of Ireland (BAI) – two months before the decision was made public. It is alleged Ó Neachtain told another PR executive – Nigel Heneghan – about the phonecall with the minister and he, in turn, relayed the information to INM’s then-chairman Leslie Buckley. The uncovering of these facts in today’s Irish Times – through court documents – raised questions during Leaders’ Questions today. The Dáil agenda was amended to give the minister the opportunity to clarify his role in the controversy. Reading out his statement this afternoon, Naughten confirmed that he did take a phonecall on his mobile from Ó Neachtain on either the 10 or 11 November 2017 (he wasn’t sure of the exact date). He told the Dáil that Ó Neachtain informed him that Ireland’s competition watchdog, the Competition and Consumer Protection Commission (CCPC) had made its decision on the merger and that the file would be coming back to the minister. Naughten told the Dáil the decision for INM to purchase a further seven titles was always likely to go to Phase 2 process (which would refer the deal to the Broadcasting Authority), adding that he would have been criticised had he not referred it on to the BAI. However, the minister, appearing emotional at times, stated that he made it “crystal clear” to Ó Neachtain that he would be following the advice of his officials, which he had not yet received. “I did not have any insider information, I had nothing to give,” said Naughten. The minister added that he did “nothing wrong or inappropriate” as minister for communications, reiterating that he “acted to the letter of the law” throughout the merger process. Sinn Féin’s Mary Lou McDonald said the minister’s actions were wholly “inappropriate”. The minister knew he was speaking to someone acting on behalf of INM and “that call should not have taken place”, she said, adding that as communications minister, he has no place offering “a personal view” on a media merger. Members of the opposition also accused the minister of misleading the Dáil in December 2016 when he was asked by certain deputies about the progress of the media deal. He was questioned why he conveyed his “personal view” to a PR person acting on behalf of INM, but did not give clarity on the issue when asked about the matter in the Dáil one month after the phone call. Social Democrats TD Catherine Murphy, who questioned the minister about the merger in December 2016, maintains she was misled with the response she received. She asked why the minister did not tell Ó Neachtain that as a minister, he could not discuss the matter with him. “If ever there were inappropriate actions, I would so far as to say a dereliction of duty,” said McDonald. The two men exchanged in “small talk” but he said as far as he can recall it was not connected to the progress of the merger. “I have absolutely nothing to hide here,” the minister concluded. 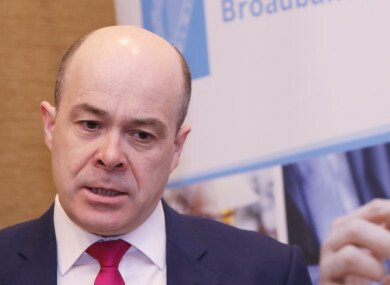 He invited politicians to inspect the media merger file in the Department of Communications, stating that TDs can go through the documents “page by page”. “I applied the legislation as it is laid out,” said Naughten. The ball is very much in the court of the opposition now – ultimately, how Fianna Fáil are going to react to the minister’s explanation of events and whether they will push the matter further or let it lie. Government sources are very much of the view that it is a case of “nothing to see here” and that the issue is likely to “blow over”. It is understood that the Taoiseach Leo Varadkar is satisfied with the minister’s explanation. Email “'I did nothing wrong': Minister defends phone call about INM merger”. Feedback on “'I did nothing wrong': Minister defends phone call about INM merger”.